A quick note. Because I’m on the Android Studio dev channel I pick up the latest (or near latest) “bleeding edge” releases for the developer builds. I tend to read the release notes before performing development installs, and this time was no different. This drop has a lot of bug fixes relative to the current release, 1.0.2, so I felt it was worth the risk. Unfortunately, for whatever reason, it triggered the dread “aapt: error while loading shared libraries: libz.so.1” error message. It was amazing how I didn’t have that with 1.0.2, all the more so since I could have sworn on a stack of bibles I’d fixed that problem already and I was doing just fine with the older version and the Android SDK. The problem is simple enough. Open a console/shell window, and type “sudo apt-get install lib32z1” to load the 32-bit libraries on your Ubuntu 64-bit system. There is really no excuse to keep running into this issue. It is not Ubuntu’s fault. This has been happening at least for the last two years, starting with Ubuntu 12.04 LTS (meaning the version of Ubuntu released April 2012), so it’s not as if someone at Google isn’t aware of it. And based on a quick Google search for the issue, it’s all over the forums. The majority of the world now runs on Ubuntu 64-bit, but then again, I suspect that the majority of Google’s internal developers still run on 32-bit Ubuntu, specifically 12.04, since that’s the version of Ubuntu (and Linux) Android Studio is guaranteed to run under. Come on, Google, get with the rest of the world. There’s also a further heads up in the Android Studio release notes. 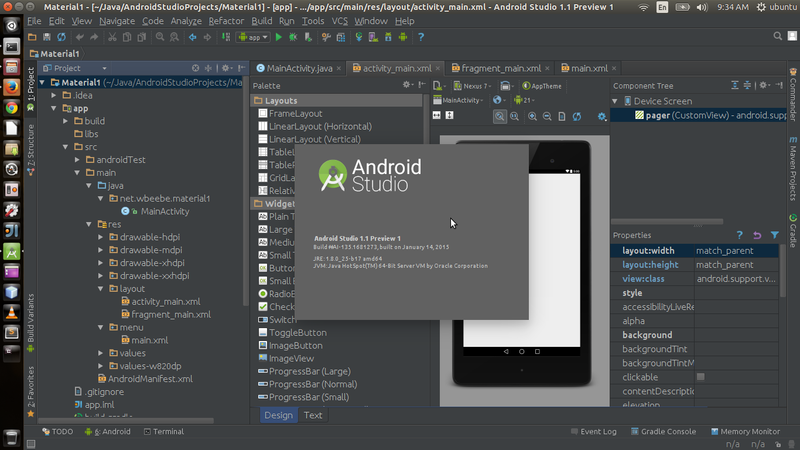 Android Studio is still based on IntelliJ 13. Android Studio won’t officially move to IntelliJ 14 until Android Studio 1.2. Since I’m also an IntelliJ user, both 13 and 14 are equally good, so the decision to stick with 13 as the code base for one more release of Android Studio and to work on bug fixes is A Good Thing. I have a Mac Mini now (a refurbished 2012 with 2TB of disk space, 4GB ram, and a quad-core i7) to run XCode and Swift on. I’ll be installing and trying IntelliJ’s AppCode IDE. AppCode 3.1 has support for Swift. I’m not switching from Android to iOS, but adding iOS to Android. And Swift is the enabler for me. I’ve read Apple’s The Swift Programming Language (it’s free on iTunes) and I’m strongly motivated to give iOS serious effort. Before Swift there was only Objective C, and I hate Objective C.